Northville Roof Repair | Northville Roofing Repair | Northville Home Roof Repair | Northville Home Roofing Repair | Northville Residential Roof RepairMcGlinch & Sons CO.
McGlinch & Sons, Co. is well-known for delivering the finest quality of roof repair services to clients across Metropolitan Detroit and Southern Michigan for close to a century. Customers are well aware that we are regarded as the most competent residential roof repair experts who are skilled at providing the most extraordinary home roofing repair work. Our certified roofing repair contractors are celebrated for not only meeting customers’ expectations, but they are recognized for consistently surpassing them. Exceptional roofing repair is as important for its appearance as it is for its purpose. Consequently, it is known that when Northville homeowners are in the market for the excellent residential roofing repair services, McGlinch & Sons is the only name they need to know! As a suburb of Metro Detroit, Northville, Michigan is located in both Oakland and Wayne Counties. There are approximately 6,000 residents who make their home in Northville. Northville homeowners who want to have residential roof repair work done on their homes, consistently pick McGlinch & Sons for those services. We are celebrated for offering the best roof repair to Northville families since 1917. It is very common for us to receive comments from Northville customers that their family members have been bringing their roofing repair needs to us for decades. That’s due to the fact that Northville residents believe that McGlinch & Sons, Co. has the honesty, integrity and reliability to get their roof repair work done in a timely manner and economically. 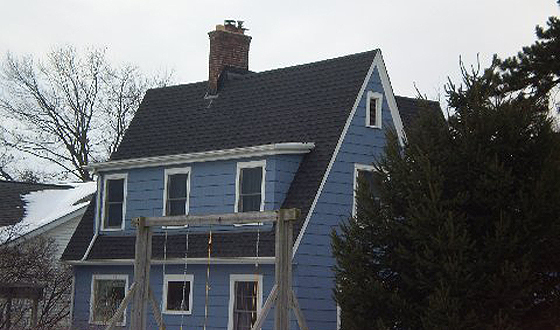 Northville clients realize that they can always count on getting the roofing repair services from McGlinch & Sons that will not only enhance their homes’ appearance but will protect their homes from damage. McGlinch & Sons endeavors to deal with all your home roofing repair projects promptly and within budget. Our roofing repair crew is well-known for having the most incomparable work ethics and business principles in the industry. Customers know all too well that they can rely upon McGlinch & Sons to perform all the necessary work associated with their residential roof repair jobs. We are eager to add you to our every-growing list of satisfied customers. Furthermore, we offer customers a lifetime warranty on all of our shingles and a 25-year non-prorated warranty on all of our labor. As a result, when you are considering state-of-the-art home roofing repair, call McGlinch & Sons, Co. at: (313) 278-2777 West Side; (586) 776-8912 East Side or (248) 987-6300 Oakland, and be sure to inquire about your FREE in-home estimate.